Historic Women’s Air Race Includes Winter Haven Pilot | Winter Haven Economic Development Council, Inc. In a previous post, we shared some of the economic benefits of having a general aviation airport in our community. Today, we’ll share another of those direct impacts – this time with a bit of a twist. First, did you know that there is an annual all-women cross-country air race? There is, but did you know that the owner of a business at the Winter Haven Regional Airport is one of the pilots in this year’s race? Before we introduce you to that pilot, here’s a bit of race history. Women’s air racing began with the Women’s Air Derby, aka Powder Puff Derby, in 1929 with 20 pilots, including Amelia Earhart, racing from Santa Monica, California, to Cleveland, Ohio. This year’s 42nd Air Race Classic (ARC) continues that tradition and will feature 56 teams of female pilots from a wide variety of backgrounds, including students from 18 colleges and universities. The 2018 ARC will begin on June 19 in Sweetwater, Texas, and end on June 22 in Freyeburg, Maine. The race will cover 2,656 miles, with eight stops along the way. Now, on to that Winter Haven connection! 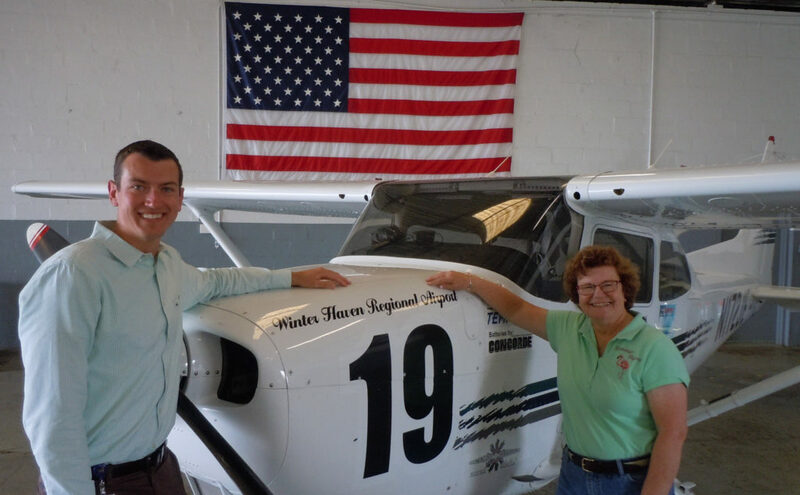 JoAnne Alcorn and her husband Steve, own DME Services, located in a hangar leased from the City of Winter Haven at the Airport. The company conducts Federal Aviation Administration (FAA) testing for aviation mechanics, and conducts over 300 tests a year. Steve is a Designated Mechanic Examiner (DME), one of fewer than 200 in the country. DME Services has earned praise from the FAA as being one of the best testing facilities in the United States. Applicants travel from around the U.S. and from all over the world to Winter Haven so they can become certified. With the Winter Haven Regional Airport decal firmly affixed to JoAnne’s Cessna 172R, our city will be well represented along this transcontinental route that will go through 15 states. If you’d like to follow the team’s progress during the race, the ARC website will have a real-time moving map. Good luck, JoAnne and Kathy!